The filters available to an instructor when viewing their course logs have changed from v 2.6 to 2.8. While the addition of the educational level filter gives them more ability, it is not intuitive to use. 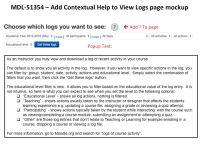 Adding contextual help will help instructors, going forward, to understand their options in viewing their course logs. See proposed popup attached to this ticket.